This is totally old news now, but you might still find this post interesting if you haven’t already read anything about this #MyCocoaGlow event! 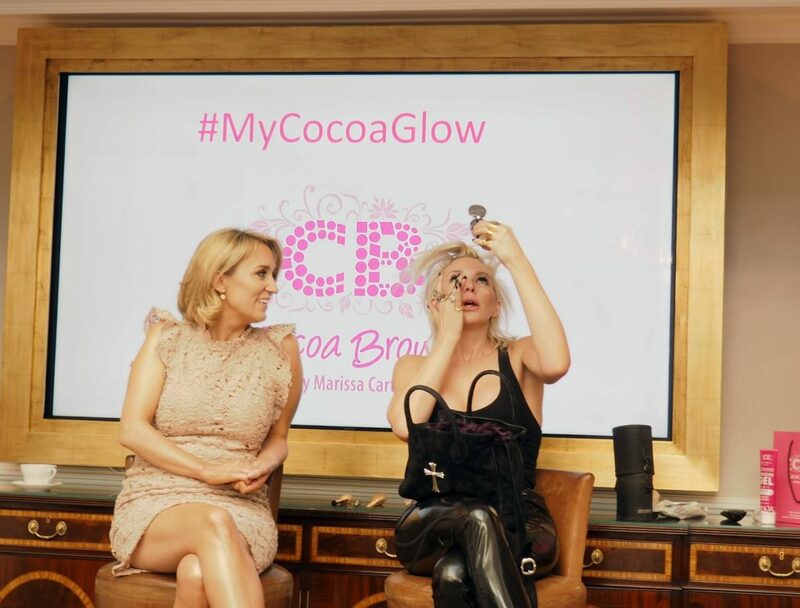 So back in March, I attended a Tanning Masterclass in London for the launch of Cocoa Brown’s latest product; Golden Goddess Oil. Not only did the event take place at the top floor of the Tower Hotel, but they also had a celebrity guest who was the star of the masterclass! If you’re a fan of Cocoa Brown, then you might have noticed that they have appointed Joyce Bonelli as the new face of Cocoa Brown. Joyce has been chosen as the golden girl for Cocoa Brown because of her fun personality and quirky sense of style. But most important of all, she is a huge fan of the new Golden Goddess Oil, which definitely came through in her interview! There were two separate masterclasses for that day and the one I went to was the morning session at 8am, which basically caters for those who has to pop to work at 9am! There were also breakfast with tea and coffee provided for us, so we could keep up with the early morning start! The session started with an intro to the Golden Goddess Oil, followed by a little live interview, where we got to know a little bit more about Joyce as well as the Cocoa Brown founder Marissa! It was surreal seeing Joyce in person and I loved her radiant personality! In addition, Joyce also had a great sense of style. Her outfit for the interview was super simple & chi and her hair looked real quirky! Joyce’s most famous clients are of course the Kardashians, but she’s also been working with some other big names like Jenner Lopez and Nicki Minaj. She’s know the Kardashians for 10 years and is basically one of them! The Kardashian’s plan well ahead and book Joyce months in advance! If you want to know about Joyce’s interview answers, then you can find it at Hello! As for the Golden Goddess Oil, I’m absolutely in love with it! It’s a dry body oil infused with golden shimmer! It’s a really versatile product and you can use it for both body and face. The shimmer looks really strong when you look at it closely, but from far away and in pictures it simply looks like you have a healthy and glowing complexion. Golden Goddess Oil is a lovely product that’s been a pleasure to use! I definitely see why Joyce Bonelli loves this product so much! During the Masterclass, Joyce basically applied the Golden Goddess Oil everywhere, but the focus was on the nose-bridge, cheeks, collar bone and eyebrows. So basically everywhere that you want to bring out and would normally apply a highlighter!